What is your favorite dish that your mother cooked you as a child? Have you ever seen that recipe written down? Sometimes the best recipes are the ones that aren’t really recipes at all. The dishes that moms and grandmas made time and time again with a bit of this and a bit of that. Maybe church cookbooks were as close as communities came to written records of these sort of family recipes. My own mother is a great home cook with a good arsenal of go to recipes. One of which was a dish she simply called ‘Stuff’. It was big pasta shells filled with a beef and mushroom mixture and cheese baked on top. It was always a hit with me. At some point in my adult life, I became a bit lazy with the dish. I experimented with making an unstuffed version of the recipe. All the same sort of ingredients but mixed together rather than stuffed. I also took away the baking portion of the recipe and did everything on the stove top. It tasted pretty much the same and ever since it has been the way I get close to Mom’s original dish. It is one of those dishes that has a lot of wiggle room. Any kind of pasta can be used but I usually use penne or small shells. Both carry the creamy sauce well. Here I have used beef but, more than once, I’ve used ground turkey with success. I go for the low fat soup but, of course, the full fat works too. At times, I’ve thrown in some frozen peas and, when I am feeling particularly fancy, I add a splash of white wine at the same time as the soup mixture. Leftovers of unstuffed version of my mom’s stuffed shells are also great for taking to work for lunch the next day. If you ask me, it actually gets better after a night of sitting in the fridge. Put pasta into a pot of boiling water and cook the length of time directed on the box. Heat a frying pan and spray with cooking spray. You could use oil too but I’m trying to stay away from unnecessary fat. Instead, I use the spray and then add a bit of water right at the end of the browning process. Once the water has evaporated,the onions have a similar texture to being fried. In this case, add the onions and garlic and cook until browned, stirring occasionally. Add the beef to the pan and brown that off too. Then, add the mushrooms and cook for a further few minutes. Stir the soup, undiluted, into the beef mixture and stir until heated through. Then, combine the beef mixture with the pasta and then mix in the cheese. You may with to add pepper to taste but between the soup and the cheese, there is probably enough salt for most people. 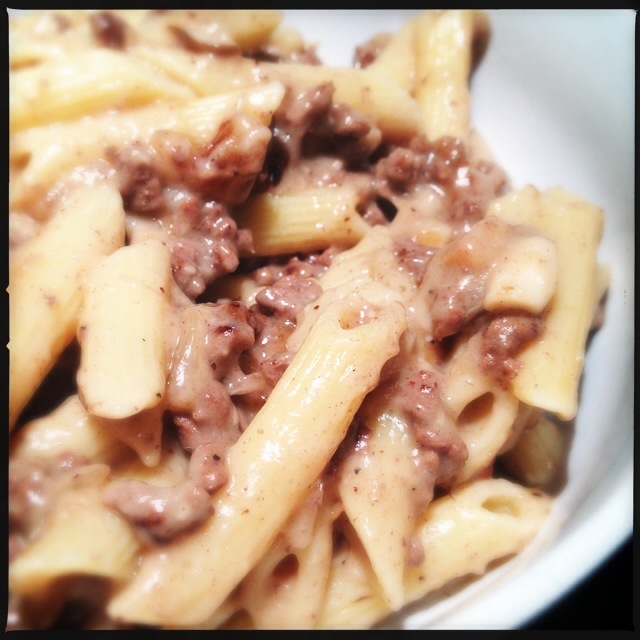 This entry was posted in Home Cooking and tagged Beef, Pasta. Bookmark the permalink.